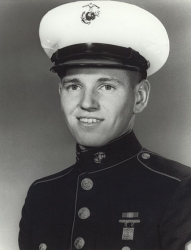 Cpl William Thomas Perkins, Jr.
Corporal William Thomas Perkins, Jr. (10 August 1947 - 12 October 1967) was a U.S. Marine who was posthumously awarded the U.S. military's highest award for valor, the Medal of Honor, for his heroic action during the Vietnam War. Perkins covered an exploding grenade with his body to save the lives of three fellow Marines. He is the only combat photographer to have been awarded the Medal of Honor. William Thomas Perkins, Jr. was born on 10 August 1947 in Rochester, NY. While in elementary school, he moved with his family to California and graduated from James Monroe High School in Sepulveda in 1965. Perkins enlisted in the Marine Corps Reserve on 27 April 1966 and was discharged to enlist in the Regular Marine Corps on 6 July 1966. 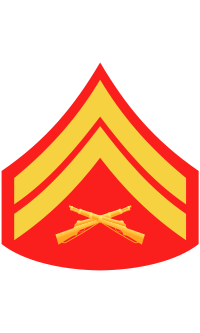 Upon completion of recruit training with the 2nd Recruit Training Battalion, Marine Corps Recruit Depot, San Diego, he was promoted to Private First Class on 22 September 1966. Transferred to the Marine Corps Base, Camp Pendleton, he underwent individual combat training with the 3rd Battalion, 2nd Infantry Training Regiment. From October 1966 to January 1967, he served as a photographer with Headquarters Battalion, Marine Corps Supply Center, Barstow, CA. He was promoted to Lance Corporal on 1 January 1967. For the next four months, LCpl Perkins was a student at the Motion Picture Photography, U.S. Army Signal Center and School, Fort Monmouth, NJ. 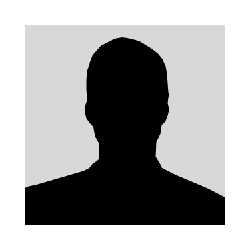 In May 1967, he was transferred back to Headquarters Battalion, Barstow. In July 1967, LCpl Perkins served as a photographer with Service Company, Headquarters Battalion, 3rd Marine Division and was transferred to the Republic of Vietnam. He was promoted to Corporal on 1 August 1967. While serving as a combat photographer with Company C, 1st Battalion, 1st Marines, 1st Marine Division during Operation Medina, he was killed in action on 12 October 1967. CORPORAL WILLIAM T. PERKINS, JR.
For conspicuous gallantry and intrepidity at the risk of his life above and beyond the call of duty while serving as a combat photographer attached to Company C, First Battalion, First Marines, First Marine Division, in the Republic of Vietnam on 12 October 1967. During Operation MEDINA, a major reconnaissance in force, southwest of Quang Tri, Company C made heavy combat contact with a numerically superior North Vietnamese Army Force estimated at from two to three companies. The focal point of the intense fighting was a helicopter landing zone which was also serving as the Command Post of Company C. In the course of a strong hostile attack, an enemy grenade landed in the immediate area occupied by Corporal Perkins and three other Marines. Realizing the inherent danger, he shouted the warning, "Incoming Grenade" to his fellow Marines, and in a valiant act of heroism, hurled himself upon the grenade absorbing the impact of the explosion with his own body thereby saving the lives of his comrades at the cost of his own. Through his exceptional courage and inspiring valor in the face of certain death, Corporal Perkins reflected great credit upon himself and the Marine Corps and upheld the highest traditions of the United States Naval Service. He gallantly gave his life for his country. The name of William T. Perkins, Jr. is inscribed on Panel 27E, Row 097. Corporal William T. Perkins, Jr. was killed in action on 12 October 1967. He is buried at San Fernando Mission Cemetery in Mission Hills, CA.